In the scenic area of Hardy County located just 100 miles from Washington, DC, Tonka piloted its new Ultrafiltration Membrane packaged treatment system. This customized system incorporates flocculation, sedimentation and ultrafiltration – a water treatment package along with full manufacturer system responsibility. The Tonka UF membrane pilot trailer is a self-contained unit suitable for either existing applications or “greenfield” sites. We pull it up, drop it, connect power, drainlines and water source, and it’s ready to go. The pilot unit can tackle surface water with organics as well as groundwater sources with iron and manganese and other contaminants. The Dow UF membranes also provide removal credits for cryptosporidium, giardia and viruses under the limits as determined by State regulators. During the Hardy County study, the influent water quality varied dramatically, with turbidity levels bouncing from 3 to 35 NTU during rainfall, snow melt and seasonal changes. Iron was typically above the EPA secondary standard during winter, while manganese was as much as five times the EPA secondary standard throughout the study. Tonka provided onsite personnel for set up, operator training and clean-in-place operations as well as teardown. 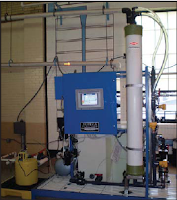 Through our unique cellular internet SCADA controls, we were able to remotely adjust the operating parameters to optimize the water treatment performance. Due to the remote monitoring by Tonka, the pilot study was able to run 24 hours a day with only a daily check in required by local operators—saving the Owner thousands of dollars throughout the study period. The Hardy County pilot study lasted 120 days and was approved by the West Virginia Department of Health without comments. At the end of the pilot Tonka had gathered 2000 hours of ultrafiltration operational data and 2700 hours of pretreatment operational data to support the final design. A full-scale Tonka pretreatment and UF Membrane system is on track for delivery in 2011 – a system chosen by the owner for treatment of the high organics in the raw water source and because they need a system that will not require continuous operator attention. The Tonka system, with its remote monitoring feature, fully meets the needs of the owner and will provide the first water treatment system in the area. A growing population in this beautiful part of West Virginia will benefit from an efficient, reliable water system with excellent quality water.